The crucial passage in the written texts of each of the “numbered treaties” passed in the Prairie West states that the Indigenous signatories “cede, release, surrender, and yield up to the Government of Canada for Her Majesty the Queen” a designated region. (Carter, 121). If the language sounds a little like a real estate transaction, earlier treaties concluded in southern Ontario are even more frankly commercial. The 1806 “Head of the Lake” treaty was signed by ten “principal chiefs,” each of whom received five shillings, acknowledging that they, “have bargained, and sold, and by these presents do, and each of them doth bargain and sell unto His said Majesty” a tract of 85,000 acres. Now, apart from the fact that misrepresentation was common and government rarely lived up to its treaty obligations, there is something fundamentally wrong with this picture. As numerous Indigenous commentators have pointed out, Indigenous peoples did not see land as a saleable commodity; their languages did not even have words to convey the sense of “ceding” or “selling” territory: thus the treaty text cannot have faithfully reproduced the oral agreements that were negotiated. Citing their oral traditions, Plains Cree and other First Nations insist that the land was never surrendered. (Venne, 192-93) This doesn’t look like a minor misunderstanding, but rather a fundamental disconnect: government negotiators were acquiring territory that their Indigenous counterparts were not giving up. Indigenous nations have long traditions of peace-making that their ancestor developed well before European contact to build and sustain relationships with different peoples, including, eventually, colonizers. The English word “treaty” – which seems to imply a single agreement fixed at one moment and for all time – may be an inadequate translation of indigenous terms such as the Anishinaabemowin, “Gdoo-naaganinaa” which, Leanne Simpson explains, uses the metaphor of “our dish” to suggest a thick constellation of attitudes and practices to sustain relations over time. (Simpson) As far as I can tell, however, (Indigenous experts can correct me if I’m mistaken), these agreements were never about the cession of territory. Similarly, when Indigenous peoples first sat down with colonists and officials to establish peace and coexistence, they focused their discussions on trade, mutual visitation and the cultivation of amity and extended kin connections. I cannot think of any instances where they contemplated relinquishing their lands. Two very different conceptions of the meaning of “treaty” are in play here – peace and friendship versus territorial cession – together with a parallel divergence over the respective role of written and oral evidence. The legal meaning of any specific treaty in today’s context is a matter for the courts to decide. But I would like to raise a historical (as opposed to a legal) question about the origins of the official approach and the strange phenomenon of the treaty-as-territorial-cession (implying also treaty-as-document). Where and when did this legal instrument and the procedures surrounding it originate? It is a question that rarely if ever arises in the Canadian historical literature, in spite of the fact that large sections of the country – essentially everything east of the Ottawa River – was colonized without recourse to any such formal cession. English-language historiography sometimes gives the impression that the world was created in 1763 and, as a consequence, the treaty of cession tends to be naturalized rather than investigated. My recent book, Property and Dispossession: Natives, Empires and Land in Early Modern North America, goes back to a time when there were no treaties of cession (when the word “treaty” was actually a term situated more in the realm of business than international relations). Focusing on the spatial practices of colonization in areas affected by Spanish, French and English imperialism, it tries (among other things) to place the emergence of land treaties in a long-term, comparative perspective. One important finding is that territory was not at the centre of Indigenous-imperial relations in the early stages. Agreements in Mexico, New England and New France were more about coexistence, trade, alliance than about delineating boundaries on the ground. In that respect, Europeans and Native Americans were on the same page, and indeed many of the early agreements, such as those enabling the French to settle at Quebec and the Pilgrims to live at Plymouth, were shaped primarily by Indigenous customs of diplomacy. Even the Spaniards who invaded Mexico amidst unprecedented slaughter and pillaging, initially modeled their exploitative colonial regime on that of the Aztecs. Like the Aztecs, they imposed tribute and other exactions on conquered peoples, but they did not take their land. In New Spain, Indigenous lands, and Indigenous tenure systems, were guaranteed by the state (less and less effectively over time, it’s true, though the principle remained). The French were able to construct a far-flung North American empire based on trade, alliance and the strategic use of violence; by and large, they explicitly recognized Indigenous territories even as they tried to assert a kind of overlordship. (They incorporated Indigenous nations into their imperial network even as Indigenous nations incorporated the French into their networks.) In areas of French colonization along the St Lawrence River, they developed tenure forms such as the seigneurie and the censive in which property rights were multiple and overlapping. In a crucial contrast with the English colonies, French land grants did not require the prior extinction of Aboriginal Title. To be clear, I’m not suggesting that French and Spanish imperialism was benevolent or that it was in any general sense “better” than that of the English. These empires intruded violently into the Americas and, with great destructiveness, they did their best to subjugate the continent’s Indigenous populations. Their ambition to dominate and to draw profit from the “New World” took many forms, including enslavement: however, the exclusive and complete control of land was not their main object. Consequently, although territorial dispossession definitely did take place in New Spain and New France, it was far less thoroughgoing and insistent than what occurred in areas of British colonization. After an initial period of adapting to Indigenous practices of alliance and coexistence, colonization in New England took the legal form of a land-grab. To the oral agreements of cohabitation and tribute payment they negotiated with Indigenous peoples, the New England Puritans started attaching signed documents in the form of real estate purchases. Whether negotiated by colonies, townships or individuals, these “Indian deeds” construed Indigenous territory as English-style property (above all, that made it alienable) in order to appropriate it for themselves; central to the sleight-of-hand involved was the fiction that English law and jurisdiction already applied. The deeds served the double purpose of documenting settler title while eliminating Indigenous claims within the growing colonial zone; at the same time, they territorialized English sovereignty claims. Since New England settlers accorded formal recognition to Indigenous territorial and property rights only as a means of completely eliminating them, Native Americans who felt they had concluded treaties of peace and friendship with the Puritans soon found that there was literally no place for them in their own country. Violence and devastation accompanied colonization everywhere, but the English colonies specialized in ethnic cleansing while creating strong property rights and territorial jurisdictions for colonists. The “Indian deeds” of early New England gradually morphed into treaties of cession as governments monopolized land transfers in the eighteenth century. The Royal Proclamation of 1763 capped off an evolution in which colonization and the assertion of imperial/settler sovereignty were constructed as a real estate transaction. Thus, around the time that Canada came under British rule, the treaty of cession was emerging as the prime legal instrument for expanding the spatial reach of colonial rule into Indigenous territories. French and Spanish colonization generally involved a less drastic transformation of legal space. There was no “ceded territory” in New France because property and sovereignty were neither absolute nor exclusive. With the British takeover of the 1760s, First Nations would face the threat of an expanding empire that, while willing to negotiate, came with exceptionally exacting territorial demands. But what about the rest of us? Do we really want to celebrate the history of the land cession treaty, a legal instrument designed for an exceptionally drastic form of territorial dispossession? In early modern times, the British propagated the “Black Legend” of Spanish cruelty in order to justify a supposedly morally superior Protestant form of imperialism. Treaties were integrated into that ideology: it was a matter of highlighting the formalities of consent and contractual exchange while overlooking the thrust towards eliminating Indigenous territories. (Greer, 2014) A strain in settler-Canadian discourse on treaties seems to echo the self-exculpatory moral complacency of the Black Legend as though the Canadian state had not been built through dispossession. Allan Greer is a professor of history at McGill University and Canada Research Chair in Colonial North America. Carter, Sarah. Carter, Sarah. Aboriginal People and Colonizers of Western Canada to 1900. Toronto: University of Toronto Press, 1999. Greer, Allan. “Dispossession in a Commercial Idiom: From Indian Deeds to Land Cession Treaties,” in Contested Spaces of Early America, ed., Juliana Barr and Edward Countryman, pp. 69-92. Philadelphia: University of Pennsylvania Press, 2014. Greer, Allan. 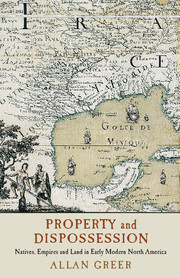 Property and Dispossession: Natives, Empires and Land in Early Modern North America. New York: Cambridge University Press, 2018. Miller, J. R. Compact, Contract, Covenant: Aboriginal Treaty-Making in Canada. Toronto: University of Toronto Press, 2009. Simpson, Leanne. “Looking After Gdoo-naaganinaa: Precolonial Nishnaabeg Diplomatic and Treaty Relationships,” Wicazo Sa Review, 23 (2008): 29-42. Venne, Sharon. “Understanding Treaty 6: An Indigenous Perspective.” In Aboriginal and Treaty Rights in Canada: Essays on Law, Equality and Respect for Difference, edited by Michael Asch, pp. 173–207. Vancouver: UBC Press, 1997.